"The absurdity of intolerance! This is what motivates me. This is what resonates to the core of my being. This is my mission - to bring an end to the intolerance that generates an 'us versus them' environment, and create a society defined by inclusiveness." 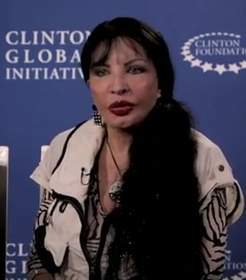 2015 marked a major year for the Loreen Arbus Foundation, beginning a two-year Commitment to Action with the Clinton Global Initiative, being honored by the LA Fire Department Foundation alongside Queen Latifah, and launching the WMC Loreen Arbus Journalism Program at the Women's Media Awards, while 2016 will mark Ms. Arbus' fifteenth and final year as Founder/Chair of the Women Who Care Awards luncheon, as well as Loreen being honoured by two organizations for her ongoing work and leadership. Loreen Arbus was honored alongside actor-producer Queen Latifah by the Los Angeles Fire Department Foundation at their 4th annual Fahrenheit Gala on June 6th 2015. The Foundation is the major source of private support for the LAFD, providing equipment, technology, training, and youth programs. At the event Loreen noted that "I am so pleased that the LAFD is especially committed to recruiting more women and to shining a light on the amazing women who are serving and protecting the people of Los Angeles as firefighters and paramedics." 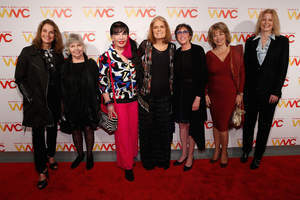 At the prestigious Women's Media Awards on November 5th in New York City, Women's Media Center co-founder Gloria Steinem announced the creation of The Loreen Arbus Journalism Program. Steinem remarked that "This program will support the research and writing of commissioned articles in our WMC Features, WMC Women Under Siege Project, and WMC Speech Project focusing on different aspects of crucial issues affecting women with disabilities and thereby raising the media presence, voice, advocacy and experiences of differently abled women." The star-studded event, which celebrated 10 years of the Women's Media Center and attracted over 350 guests, was Co-Chaired by Loreen alongside Jewelle Bickford, Lauren Embrey, Sheila C. Johnson, Pat Mitchell, Bonnie Schaefer, Regina K. Scully, Pamela Shifman, Mary and Steven Swig and Women's Media Center Co-Founders Jane Fonda, Robin Morgan and Gloria Steinem. Breakout comedian/writer/actor Amy Schumer made a special appearance at the event. The Loreen Arbus Foundation was a Media Sponsor of the event and Loreen is a WMC Emeritus Board Member. 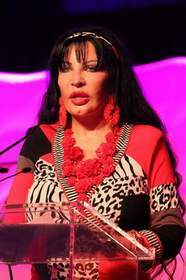 On May 9th at Cipriani 42nd Street in New York City, Loreen Arbus will for the final time take the reins as the Founder and Chair of the 15th Annual Women Who Care Awards Luncheon, one of the most high-profile, philanthropic events on the city's calendar. This star-studded New York tradition celebrates the accomplishments of women as caregivers, philanthropists and professionals, and benefits United Cerebral Palsy of New York City. The event has raised over $8 million during its fourteen years to help enhance the lives of children, adults and families living with disabilities. Emmy® Award-winning actress Susan Lucci, now in her fourth season as star of the hit series "Devious Maids," will return for the fourth consecutive year to host the event. 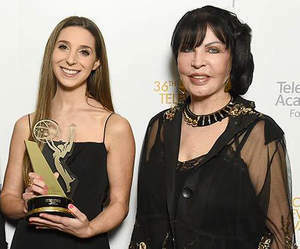 For the first time, Liza Huber, Founder & CEO of Sage Spoonfuls and past star of the hit TV series "Passions," will co-host the awards luncheon with her mother Ms. Lucci, for the event taking place the day after Mother's Day. Celebrity Co-Chairs for the event are Tamsen Fadal, Emmy® award-winning Anchor of PIX 11 News; Robin Givens, actress/director/author; Donna Hanover, journalist/radio personality and former First Lady of New York City; Ali Stroker of "Glee Project" and "Glee" fame; and Emmy® Award winner Paula Zahn, host of Discovery Channel's "On the Case with Paula Zahn." The Loreen Arbus Foundation is teaming up with Tari Hartman Squire, Founding CEO of EIN SOF Communications, Inc., to produce the Lights! Cameras! Access! 2.0 initiative as a two-year "Commitment to Action" with the Clinton Global Initiative (CGI), which will address the under-representation of people with disabilities in media. This comprehensive initiative launched in 2015 includes disability-inclusive diversity in advertising, entertainment, interactive and broadcast. Arbus and Hartman Squire are co-hosting and co-producing Think Tanks and "Call to Action" Summits in New York and Los Angeles which aim to improve disability portrayals on large, small and personal screens, increase employment of civilians and veterans with disabilities in front of the camera and behind the scenes, and increase accessible entertainment for audiences with a variety of disabilities. To see Loreen and Tari Hartman Squire's CGI Commitment to Action captioned video in sign language, click here. Loreen Arbus will be honored with two major awards this year, recognizing her philanthropic work and leadership. On June 9th at the Yale Club in New York City, she will be honored with the Project Pay It Forward (PIFA) Award, which recognizes outstanding individuals who have dedicated their lives to giving back, who celebrate paying it forward and who inspire others to take action. Past awardees include Sir Richard Garriott de Cayeux, Lucia Kaiser and Dr. Stephen Post. Project Pay it Forward encourages paying it forward and promotes positive youth development through easily accessible character education, resources, video, interactive platforms, grant opportunities, and community events. In October, Loreen Arbus will be honored with the Arthur Ashe Institute for Urban Health Leadership Award at its 22nd Annual Sports Ball Gala in New York City. Its honorees are recognized as trailblazers, exemplifying Arthur Ashe's commitment to making the world a healthier and more equitable place. The funds raised at Sports Ball support the Arthur Ashe Institute's innovative community health education programs and research initiatives. Arthur Ashe founded the Institute in 1992, in partnership with SUNY Downstate Medical Center, just two months before his death from AIDS and in response to the disproportionate amount of illness and death in urban communities from preventable causes. Past award recipients include tennis stars Billie Jean King, Andy Roddick and Venus Willliams, poet Dr. Maya Angelou, HBO Sports host Bryant Gumbel, actor & advocate Boris Kodjoe, hockey Hall of Famer Rod Gilbert and baseball star Keith Hernandez. Loreen Arbus was featured as Altruist of the Year in the 2016 edition of Modern Luxury's Charity and Social Datebook Los Angeles, a "who's who of LA's philanthropic leaders," answering a Q&A about her impact, challenges and legacy. She was recognized at a celebratory reception on March 22nd at Harry Winston in Los Angeles. The full article can be found on page 15 of the digital issue. In 2016, Loreen will again present a number of scholarships and awards, to students and activists whose storytelling sheds light on people living with disabilities, helps emerging artists gain recognition and increases visibility for people with disabilities. On April 23rd 2015 at the Skirball Cultural Center in Los Angeles, during The 36th Academy of Television Arts and Sciences College Television Awards, Loreen presented the Loreen Arbus Focus on Disability scholarship to Natalie Whalen of Chapman University, for her film "Unspoken." The award is presented to a student filmmaker whose work not only increases visibility but also opportunity for people with disabilities. These awards recognise excellence in video, digital and film work produced by college students. Loreen will present the 2016 College Television Awards Focus on Disability Scholarship on May 25th 2016. At The Gracies, hosted by the Alliance for Women in Media Foundation (AWMF) on June 22nd 2015 at the Hilton Midtown in New York City, the Loreen Arbus Focus on Disability scholarship was presented to Amanda Morris for her essay where she wrote that "The American Disabilities Act should really be renamed the American Abilities Act, because ability is its primary focus." 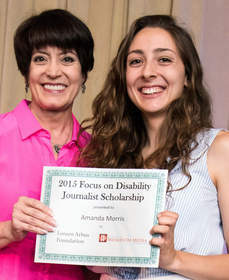 This scholarship is awarded to one of tomorrow's media professionals who crafts the most compelling story focused on the needs, achievements, contributions and lives of citizens with disabilities. Loreen will present the 2016 Focus on Disability Scholarship at The 41st Gracie Awards, at the Beverly Wilshire on May 24th, 2016. For 35 years, New York Women in Film & Television has presented the Muse Award for Outstanding Vision and Achievement to women behind and in front of the camera. At the 2015 event held December 10th at the Grand Ballroom of the Hilton New York, hosted by actress and CBS Commentator Nancy Giles, the 10th annual Loreen Arbus Changemaker Award was presented to Lizz Winstead, writer, producer, comic, co-creator of "The Daily Show" and founder of Lady Parts Justice, who spoke at the event of "demanding justice for women's health care." This year's other Muse honorees included actors Gabourey Sidibe, Blythe Danner and Patricia Clarkson, as well Sarah Barnett (President and General Manager, BBC America) and Victoria Alonso (Executive Vice President of Physical Production, Marvel Studios). Loreen will present the 11th annual Loreen Arbus Changemaker Award at the 2016 New York Women in Film & Television Muse Awards. In addition, through the generosity of Loreen Arbus, New York Women in Film and Television has established the Loreen Arbus Disability Awareness Grant. The film completion grant for $7,500 will be awarded to a US-based woman filmmaker for a film on physical or developmental disability issues. The Grant will be awarded to help complete a work-in-progress: films must have completed principle photography, but not be finished, to be eligible. Girl Forward is a new editorial initiative supported by Loreen Arbus, through Teen Voices at Women's eNews for girls with physical disabilities. 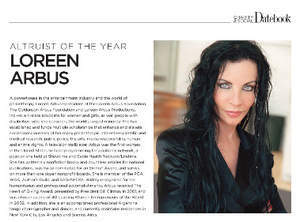 Arbus introduced Dr. Danielle Sheypuk, psychologist, activist and wheelchair-user to Women's eNews. Together they are developing a series of reported, journalistic articles and first person essays by, about and with girls with disabilities. On November 13th 2015, it was announced that it had received a $50,000 grant from NBC Universal, as part of the 21st Century Solutions grant challenge. Teen Voices at Women's eNews is a news site and mentoring program that offers educational and career building opportunities to female teens who are interested in writing, journalism and media. Girls from any country, state, school and background are invited to raise their voices as tools of change. The program provides girls with the skills to combat stereotypes and participate in wider discussions and authentically portray their life experiences. There is no other known organization which offers the same publishing and mentoring experience in the world. The Loreen Arbus Foundation has made possible Dr. Michelle Ballan's current efforts to advance research on intimate partner violence among women with disabilities, including the development of a demographic profile of survivors with disabilities and a qualitative study on self-protective methods. Dr. Ballan has assembled an experienced team of clinical staff and researchers dedicated to reducing intimate partner violence against women with disabilities. Her team produced a case review of 1056 files of survivors seen at a Domestic Violence program known as the Secret Garden. This research has resulted in the publication of two articles in scientific journals, with another under review, and two more in the formulation process. Dr. Ballan has just completed the first research study on self-protection techniques and strategies used by women with physical disabilities experiencing intimate partner violence. With the support of The Loreen Arbus Foundation, the Media, Diversity & Social Change Initiative at USC Annenberg has added the analysis of characters with disabilities as part of the annual study of the top 100 films. The MDSC Initiative will continue its work to provide high quality research data on diversity in media to activists, organizations, and the entertainment industry. The Loreen Arbus Foundation supports Stacy Smith and MDSC where they have released a groundbreaking study with Women in Film Los Angeles and Sundance Institute on barriers facing female directors. Stacy and her team have conducted the first-ever examination of the gender of short film directors at top international film festivals. The American Civil Liberties Union relied on MDSC Initiative statistics and findings in its letter to the Equal Employment Opportunity Commission on behalf of female directors. The MDSC Initiative has mapped the career pipeline for women working as film directors. The Loreen Arbus Foundation supports a broad scope of interests including advocacy for women and girls, scientific and medical research, minorities, people with disabilities, media responsibility, the arts, human and animal rights, and public policy. The Foundation has established and funds many scholarships that both enhance and elevate social consciousness around key societal issues. Loreen Arbus is currently the President of The Loreen Arbus Foundation, The Goldenson-Arbus Foundation and Loreen Arbus Productions, Inc.
Ms. Arbus holds the distinction of being the first woman to head programming for a U.S. network, a feat accomplished twice (both at Showtime and Cable Health Network/Lifetime). She has been twice nominated for an Emmy. A prolific writer, she is the author of six books and numerous magazine/newspaper articles. She is a member of The Writers Guild, The Producers Guild, The Author's Guild and SAG-AFTRA. Ms. Arbus, widely recognized for her humanitarian and professional accomplishments, has received The Heart of Giving Award presented by President Bill Clinton in 2001; the Genii Award for Lifetime Achievement presented by American Women in Radio & Television; the Power 100 Women In Entertainment presented by The Hollywood Reporter; the 21 Leaders for the 21st Century Award presented by Women's eNews; the Media Access Award in 2007; and the Distinguished Service Award presented by the Academy of Television Arts & Sciences, among many other honors. Gloria Steinem presented her with the Ms. Foundation for Women 2011 Woman of Vision and Action Award. In December, 2006, she was inducted as an honoree into the She Made It: Women Creating Television and Radio collection at the Paley Center for Media. In 2012, she delivered a TEDxWomen talk about overcoming childhood struggles. In 2014, she was honored with the UN's Woman Pioneer Award. Her speech, focused on disability rights, was seen in over 120 countries on the occasion of Women's Entrepreneur Day. She serves on over a dozen non-profit boards, including the Executive Committee of the Harvard Kennedy School of Government Women Leadership Board and Women Moving Millions, which is dedicated to mobilizing unprecedented resources for the advancement of women and girls. Ms. Arbus lives in NY, LA and Buenos Aires. She is a high profile professional Argentine Tango choreographer and dancer. Ms. Arbus is the daughter of Leonard H. Goldenson, Founder & Chairman of ABC and Isabelle Goldenson, whose work in the area of disability rights established United Cerebral Palsy (UCP), now one of America's largest health agencies, and launched the very first national telethon in the US. "Being an outsider forged my character, imbued me with resilience and strengthened my being. My early identification with those who are disenfranchised combined with my anger (I acted out and was a truant in school), ultimately was channeled into an intolerance of, and an unwillingness to accept the status quo. I have always believed it to be absolutely and utterly unforgivable to prejudge and disrespect human beings simply because they are different."